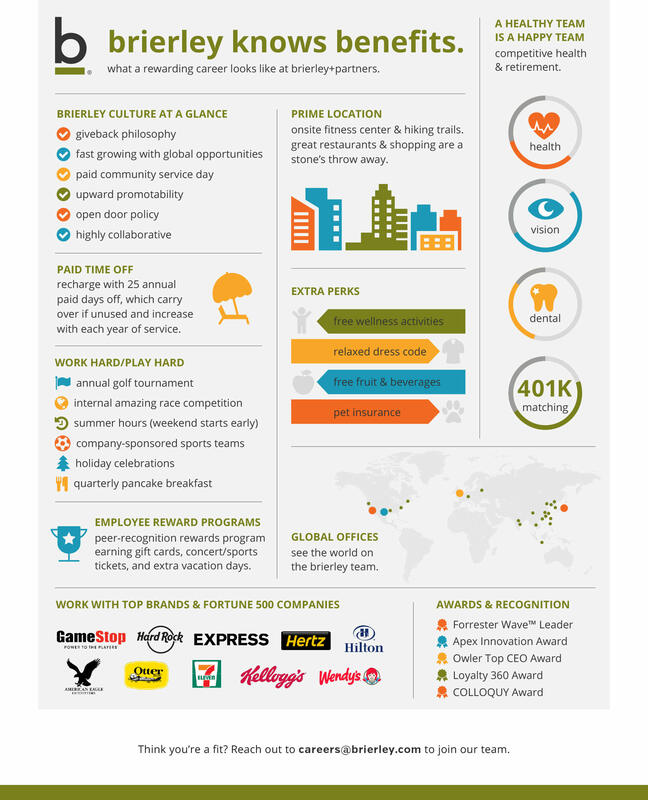 See what a rewarding career at Brierley+Partners looks like. Our exciting, culture-focused company is looking to add Product Owners who embrace challenges and is eager to work with complex solutions. You will use the latest tools and methodologies, and will work with "big name" companies across multiple industries vs. being siloed to one. We are seeking a highly motivated Senior Full Stack Engineer to work with a talented team that develops industry leading loyalty applications. This is an excellent opportunity to work with a diverse team of passionate professionals who love to build elegant solutions. In an environment of continuous learning, we are guided by a primary vision: shape a world where every relationship is meaningful. Our products and suite of data tools drive software innovation for many of the world’s most admired brands, helping enterprises move with greater business agility. As a Senior Full Stack Engineer, you’ll primarily work with .NET / C# / PL/SQL and have shared ownership of technical design, data modeling, and custom application development. We are in the process of transformation, and our team is growing! We are looking for a talented Project Manager who will be responsible for successfully planning, managing and delivering exciting projects according to strict deadlines and within budget. You will leverage lean project management philosophies, software and associated processes. This includes projects that cross technology, creative, strategy and analytics disciplines. Deep in the midst of our Agile transformation, we are actively seeking a seasoned Senior Technology Implementation Consultant for our growing company! You will be responsible for designing, configuring, delivering and supporting high quality product-based client software applications. You will serve as a trusted advisor and an active contributor to the success of client engagements through extensive product knowledge. The results you produce have a direct impact, making you truly integral to the ultimate success of our relationship with our clients. We are seeking to add a Multi-Cloud Architect to lead and maintain the design, implementation and documentation of end-to-end solutions for multi-layered applications on a variety of technology stacks. The Multi-Cloud Architect will open up the boundaries in adopting the best design practices and ensure our products fit elegantly and comprehensively across our solutions. We are growing and seeking a Senior Data Analyst to join our Consumer Insights team. Individuals on this team are expected to be comfortable working in a quantitative research capacity providing actionable business insights that frequently require manipulating and analyzing complex, high-volume, high-dimensionality data from varying data warehouse sources. We are actively seeking an experienced Enterprise Agile Coach to join our team as we are in the midst of our Agile transformation. In this role, you will act as a trusted advisor and servant leader to the organization and Agile teams throughout their Lean-Agile transformation effort. You will have the opportunity to lead, direct and be accountable for the overall performance of the PMO team in the delivery of the portfolio through lean and agile practices. You will be instrumental in our journey to Agile, and will collaborate closely with executives, providing your Agile thought leadership along the way. We are seeking an energized Digital Brand & Creative Design Specialist to join the Sales & Marketing team at Brierley. You will assist the Sales & Marketing team in designing and creating effective, dynamic presentations, redesign marketing content & collateral, handouts and case studies. You will also assist in bringing the company mission & values to life through corporate branding and content creation for company website and other channels. We are seeking a Product Owner to join our Product Development team which develops our flagship LoyaltyOnDemand platform. As a Product Owner, you will establish a close relationship with our various stakeholders, perform market and software analysis, backlog grooming and prioritization, requirements engineering, technical writing, and work closely with the development team to guide the delivery of new features and enhancements to our industry-leading software products. We are looking for a seasoned technical leader with 8+ years of professional experience building and supporting enterprise software solutions with demonstrated ability in combining technical and leadership talents in creative ways that get results from the development team and approval/support from management and the business. We are seeking a talented Client Services Specialist who will be primarily responsible for the client project scheduling and prioritization. You will own the development and delivery of multiple client projects with a specific focus on delivering to budget, to schedule and to the standard expected from the Agency and the Client. We are looking for a talented Senior Quality Engineer to join our Quality Assurance team! You will be responsible for performing manual and automation testing using open source tools as well as enhancing/maintaining existing automation solution to support functional, integration and regression testing activities across all product platforms. The primary responsibility of this role is to develop automated test solutions to ensure the accuracy and reliability of product software. You will design tests, drive test implementation, execute tests, analyze pass rate and requirement coverage to deliver quality product on time. We’re the global hybrid marketing and technology leader in loyalty and reward program solutions, and we’re growing! Our high-tech, culture-focused company is looking for a seasoned Senior Manager of Client Services who is instrumental in the development, execution, and performance of award-winning loyalty and CRM programs. As the trusted liaison between our internal service lines and external client contacts, you’ll be responsible for building strong, on-going relationships with our clients, all the while ensuring a high level of client satisfaction and delivering exceptional quality output. We are on a mission to find an enthusiastic, challenge-hungry professional to hit the ground running as a Product Support Analyst for our Product Development team. As an essential member of this fun and driven team, you will establish a close relationship with various stakeholders and end-users, organize incoming support requests, communicate frequently with requestors, and prioritize and coordinate activity to ensure proper resolution. You must be eager to learn about software product development and must be willing to dive in and help ensure timely and thorough support for our client account teams. 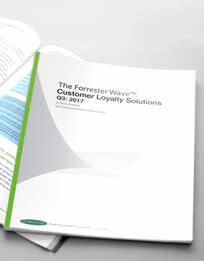 You will be exposed to a large breadth of technology, applications, functionality, and software development practices, and your work will directly influence software for some of the most revolutionary ideas in customer loyalty! We are in the process of transformation. What does that mean for you? Massive opportunity - specifically, in this role! We’re the global hybrid marketing and technology leader in loyalty and reward program solutions, and we’re growing. Our exciting, culture-focused company is looking to add a well-rounded Corporate Recruiter who embraces high-volume, placing a variety of skills from true backend product/infrastructure/database development to client facing account management roles to executive level. We are seeking a Creative Department Intern to join our team for the summer. The Intern will work with the Creative Director providing support to the Creative team. The position will have an emphasis on Digital Design and Art Direction. Candidates will have the opportunity to work on a variety of high-profile client projects and campaigns: creating mockups for responsive e-mails, landing pages, logos, icons, infographics, marketing materials and other projects within the Creative department. Brierley+Partners is the global marketing and technology leader in loyalty and reward program solutions, and we’re growing! Our high-tech, culture-focused company is looking for a seasoned Director, Sales & Marketing executive who will serve as the first point of contact for future clients and partners and will play a lead role in the development, execution, and close of new business pursuits and strategic partnerships. As the trusted liaison between Brierley and client prospects, you’ll be responsible for cultivating valuable relationships, developing new partnerships and driving new business, all the while representing the best of what Brierley has to offer.